Gilbert Kerr was a member of the crew of the Scotia on the 1902-04 expedition, and was the official piper of the Expedition. 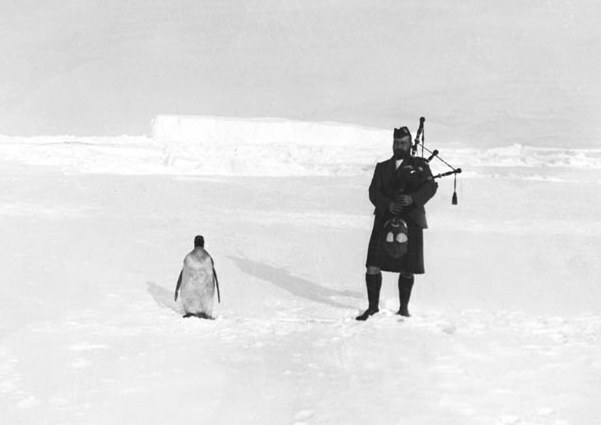 In this capacity he was photographed performing in full Highland dress even in the harsh Antarctic environment. The emperor penguin accompanying him in this photograph was evidently found to be sufficiently reluctant as a listener to require tethering to a large cooking-pot packed full of snow, but any other scientific discoveries resulting from such experiments were apparently not recorded. This photograph was made into a postcard, and thus became one of the first items ever to be posted from Antarctica.